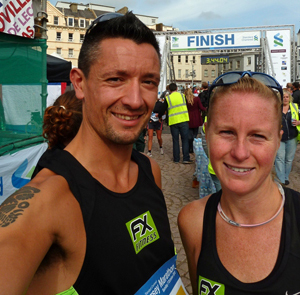 FX Fitness are Terri & Dan Garrido, a husband & wife team of REPS Level 3 qualified personal trainers (Dan has a certificate in personal training and Terri has a diploma). FX Fitness has a multi-disciplinary approach to training with an emphasis on “functional” whole body movements, using training techniques such as Olympic Weightlifting, powerlifting, TRX, kettlebells and ViPR – all exercises are especially selected to be relevant for each client and suitable for all abilities and levels of fitness. Terri and Dan are both qualified Spinning™ instructors and take regular spin classes at Fitness First gym. Both Terri and Dan are also accredited UK Athletics assistant coaches. Dan is an Olympic Weightlifting Instructor, Advanced Kettlebells Instructor and Crossfit Level 1 Trainer, Crossfit Endurance Coach and Crossfit Aerobic Capacity Coach. Over the last 12 years, Terri has participated at a competitive level in many races from 5K to full marathon, and Dan has followed suit, having run competitively since 2011. Dan has recently started competing in triathlon, having won his first triathlon, a novice super-sprint event. He now specialises in providing strength and conditioning for runners, cyclists and triathletes. Dan also provides running coaching, with an emphasis on ensuring correct technique first and foremost using advanced gait analysis and retraining to ensure optimal biomechanics and injury prevention, and running programming for all levels of fitness and goals. Terri and Dan are both vegans, and happily promote a compassionate lifestyle and a plant based diet, and are both keen to disprove the myth that vegans are weedy! Click below to like us on Facebook to keep up to date on our latest personal training and group exercise services and special offers!